If you have a poster that needs to be framed or a family portrait that needs a new frame, hit up Kumar Frame Works in Malleswaram. Charges start at INR 100. 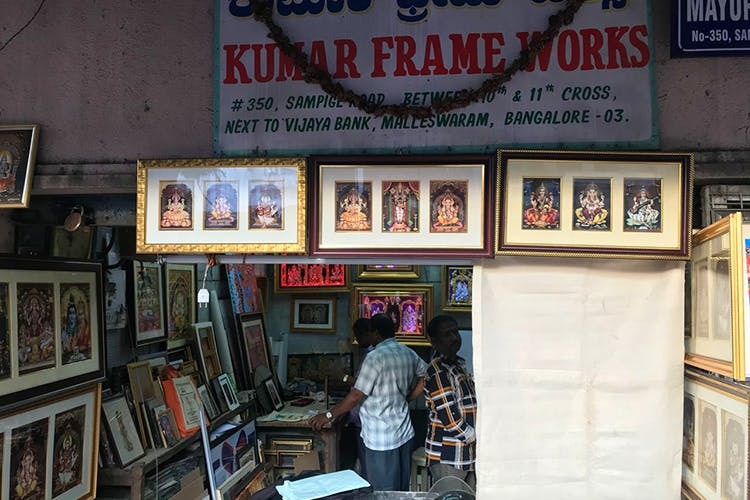 If not for the multiple framed photos of gods and characters from mythologies, Kumar Frame Works is a non-descript store that can be easily missed. Located next to Vijaya Bank in Malleswaram, near 8th Cross, the store is a haven for anyone who’s looking to get some framing done. The store’s small, but every inch it, including the outside and inside walls, are lined up with all kinds of frames. Don’t be taken aback by the millions of frames featuring Hindu gods, the store constantly supplies to temples and households in the area. Rest assured your massive Batman or Captain America poster can be framed as easily as those. So can all those family photos that you have been meaning to put up in your drawing room. Once the pleasantries are done, the store owners will ask you what kind of frame you are looking for. You will see glass frames, those with LED lights, OTT kinds and those that look like they belong at some royal household. We’re currently amused by 3D frames that add a whole new perspective to a flat frame. Simple black frames start at INR 100 and you can opt for a glass framing for additional charges. They do laminate framing as well. We spotted quite a lot of designs and colours such as carved ones and red and blue frames. Those LED frames that we were talking about earlier, those can be made as well, though they cost about INR 1,000 upwards. They also do reframing as well as fixing up broken frames, so be sure to hit these guys up in case you want that photo frame fixed that you broke once upon a time.